SN and area residents planted 20 trees using a new device, called a Waterboxx, at nine bus stops on Burnet Rd and Anderson Ln on March 11, 2012. The project involved a seed grant (literally) from CapMetro for half of the 20 waterboxxes. The Waterboxx has subsequently become SN's tree-planting tool of choice, and were used in all subsequent plantings through fall 2014. The waterboxxes are donut shaped and fit around seedlings, protecting them and slowly emitting water. The waterboxxes collect heat during the day to condense water at night, and then do the reverse during the day. In theory, this principle plus rain collection allows them to self-irrigate the trees. After one year, they are removed and can be reused. The following blog records outcomes from the trees planted in 2012. 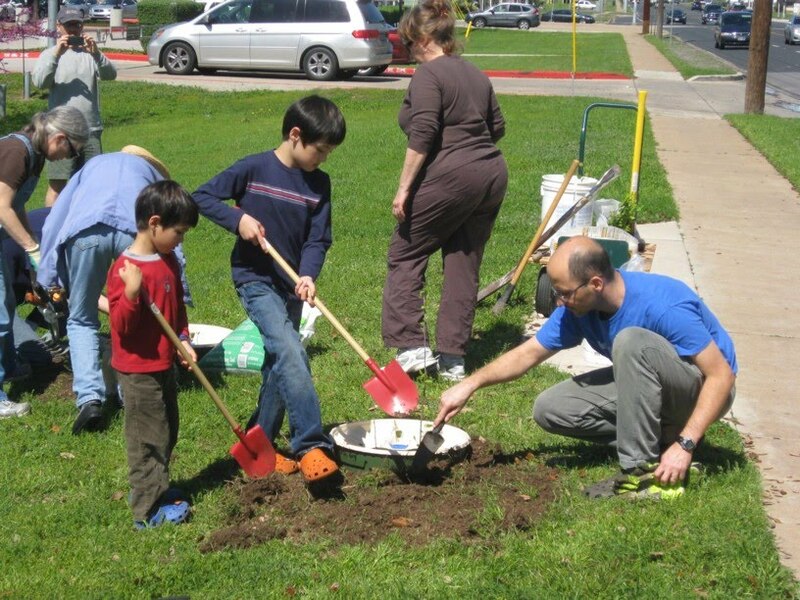 Between September 2012 and March 2013 we planted another 60 waterboxx 1-gallon trees along major commercial streets in NC Austin. The winter of 2012-13 was dry and warm. 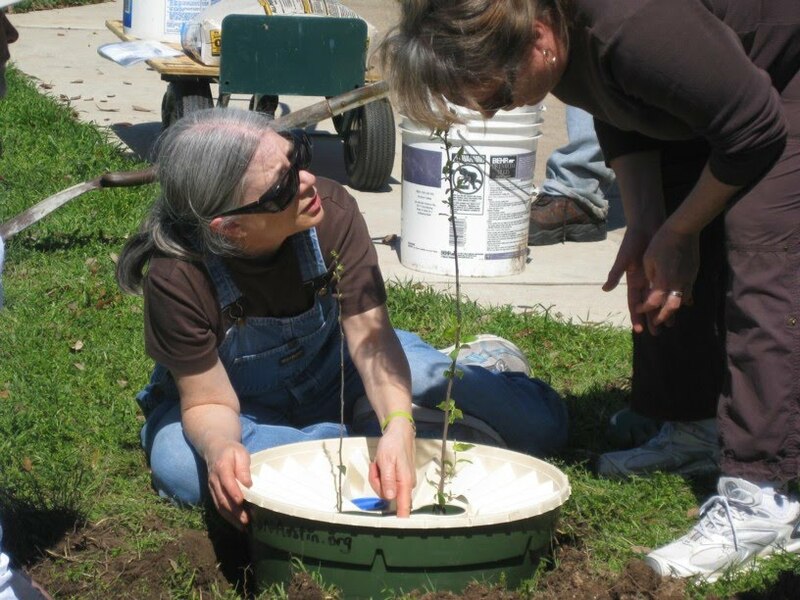 Between January and May 2013 we lost 1 of the trees from the March 2012 waterboxx season, and 12 of the newly planted waterboxx trees. About half of these were due to non-natural causes (2 were physically pulled out, 2-3 were also removed, possibly due to strong winds, 1 was run over by a vehicle). The rest apparently died of stress. Most of these trees were replaced. In June, we lost 1 more of the March 2012 trees and 5 recently-planted trees. Again, the causes were split evening between non-natural (2 physically pulled out, 1 hit by mower) and natural (mainly from an early heat wave). Many other trees in June were showing signs of stress, including browning leaves or wilt. We increased watering by our paid student to once a week, plus random supplemental watering by volunteers. Also, July delivered plenty of rain and cooler temperatures. During August we maintained watering discipline, except for one week between August 15-23 when a watering was skipped due to miscommunication. This missed watering caused considerable stress to many trees, but no losses. The first waterboxx season was 100% successful, whereas the success rate for the second season, excluding trees intentionally pulled out or trees replaced, was about 80%. Three factors may have contributed to this difference. First, in March 2012 we stuck to Groasis instructions and planted 2 4" liner trees, so there was at least one spare tree per waterboxx. We did lose some spare trees, but never both in the same waterboxx. 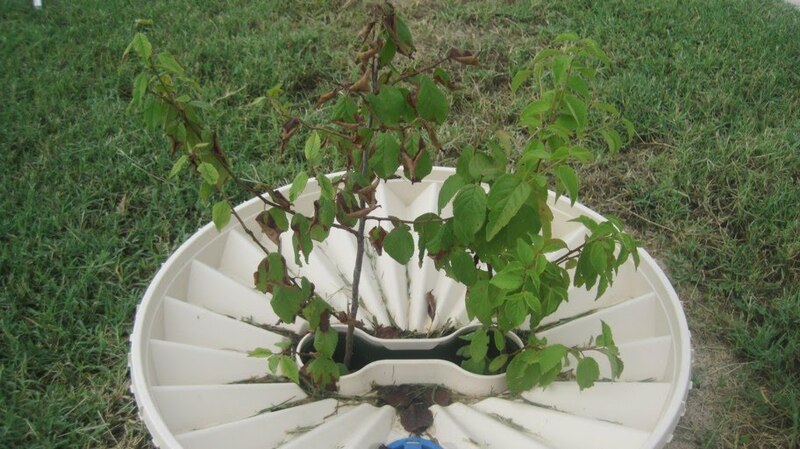 In the 2013 season we planted one 1-gallon tree per waterboxx. Second, the 2012 season was cooler than the 2013 season. Finally, the 2013 season was more ambitious, with 3 times as many trees in more locations. Going forward, we learned the following lessons: 1) in locations where mowing is infrequent or where vehicles are able to pull up, place fence posts and flagging to make the waterboxx more visible. The natural coloring of the boxxes make them hard to see. 2) when available, plant 2 liner trees instead of 1 1-gallon tree. 3) one tree that we lost was an escarpment black cherry, which we subsequently learned is an understory tree less well suited to full-sunlight conditions. 4) Waterboxxes provide buffering and minimal moisture, but are insufficient in our high-heat, low-humidity environment to protect the roots. Light but frequent watering (quarter gallon, at least once a week, plus a modest layer of mulch directly in the well hole, helps to keep the trees healthy even during heat waves. Finally, it should be noted that even though we lost a number of trees early in the season, these were 1-gallon trees that we could quickly and cheaply replace. So our actual success rate for establishing trees during the season was closer to 90%. 8/25/2012 - We are nearly at the end of August and all of the waterboxxes still have at least one live tree. The health of the trees varies widely. Some trees at benevolent locations are over 4 ft tall and thriving. Others remain about the same size as when planted and show signs of stress. August was relatively mild, with highs mostly in the 90s and an inch of rain mid-month. At this time, barring a final heat wave, I think we will get a 100% success rate for the first year. 7/20/2012 - We got over 5 inches of rain in mid-July, and this had the added benefit of bringing temperatures down into the 90s. Both factors have brought a welcome respite to the trees. August, of course, remains the critical month to get through. But I'm excited that we're nearly to August and all of the waterboxxes still have at least one healthy tree. Here's a photo of a waterboxx at 6900 Burnet, where one of the plums is in poor shape, the other in good shape. 7/9/2012 - Visited several waterboxxes this afternoon. Several of the Mx Plums are in poor shape, with up to half brown leaves. One new dead plant at 8701 B. I think this is the result of a heat wave a few weeks ago. Weather the last week or so has been milder and just recently - more humid. But almost no rain yet. 6/26/2012 - Visited four bus stops and topped off water. Water levels are being drawn down faster now that it's dry (no substantial rain in more than a month) and hot (109 - new record - today). A couple of the boxxes have "dominant" and "recessive" trees in them, i.e. one tree seems to be thriving while the other is sickly. Am starting to suspect that this happens a lot - the two trees are competing with each other for limited space and water. Of course, the Bermuda grass is pretty aggressive too and in many boxxes is a third tenant. One happy chance - the two boxxes with leaks are definitely getting supplemental water from sprayers installed by the adjacent commercial that cover the grass in the ROW. The redbud there is thriving. 6/9/2012 - Some bad news - two of the trees on Anderson are dead. The only consolation is that these are both "spare" trees (each waterboxx has two seedlings so if you lose one, you still have the other). What's very odd is that in both of the waterboxxes that lost a tree, the other tree is thriving. Nor is water seemingly an issue - both tanks had water. Did notice that Bermuda grass managed to grow through the water holes and root into the water tank. Removed that. One of the plums in front of Redeemer Lutheran Church is about 3-4 ft tall. 6/8/2012 - All trees on Burnet still looking good. However, it hasn't rained in a few weeks and it's about to get really hot. Will watch and hope for the best. 5/23/2012 - Toured most of the waterboxxes after work today. All the trees are in good shape. Even those that had looked iffy seem to be doing better. Several are showing new growth. The trees that got weed-whacked have made an astounding come-back, as though it had never happened. Water tank levels are excellent, except for the two boxxes that have leaks. The real test is fast approaching - summer. Temperatures will climb and rain may be infrequent. It's the real question we've had about these silver-bullet devices from the start - will they keep the trees healthy through June-September. 5/5/2012 - Reinstalled the waterboxxes around the trees on 5/2. Visited on 5/3 and observed that one of the repaired waterboxxes was holding most of its water (still releasing faster than desired, but not nearly as fast as before). The other waterboxx was mostly empty. 5/1/2012 - Removed the two waterboxxes that release water faster than the others. Sure enough, there's a crack in both of them, right where the hole is for the wick. It seems plausible that this happened at the time of installation when the team was trying to get the wick through the hole. Other teams also had trouble getting the wicks through the hole. In one instance we kept having to trim the wick down because it kept unwinding and was impossible to work with. I've bought some silicon to try to seal as much of the crack up as possible. Most of the waterboxxes are now well below full. I filled a number of them up during an inspection today. I'm guessing that a normal waterboxx will run through its water in about two months, though this could accelerate over the summer. Fortunately they take so little water that you can usually fill them all up with a couple of jugs. 4/22/2012 - Most of the trees remain in good shape. Trees in the two waterboxxes in front of the Infiniti dealership got weed-whacked. The dealership management has promised to instruct their landscape team to avoid that in the future. They are also considering a proposal to plant more trees in the right of way in front of their dealership this October. Groasis, the company that makes the Waterboxxes, is sending us a packet of new wicks so we can replace the ones on the waterboxxes that empty out too quickly to see if that is the problem. It's definitely getting drier. Looks like our respite from the drought may be ending, so we will have a good trial for the waterboxxes under semi-arid conditions. 4/5/2012 - The following table is ordered by bus stop, then waterboxx, then tree (two trees per waterboxx, one on West side and one on East). "8801 B" means 8801 Burnet, east side. Tree height as measured from base of trunk. 3/27/2012 - Visited some waterboxx sites on way home from work. Disturbingly, one of the plants at a waterboxx at Anderson@Gault was missing entirely. At 8801 Burnet, two of the three waterboxxes were empty, and one of the trees that had come unstuck was loose again. Elsewhere, most waterboxxes still had full or nearly full tanks. It's odd that some would be full and others empty. I'm assuming it's mainly the wick. 3/25/2012 - At 11 PM, no condensation. Dew point 59 F, air temp 68 F, relative humidity 73%. This is drier than at the same time last night. 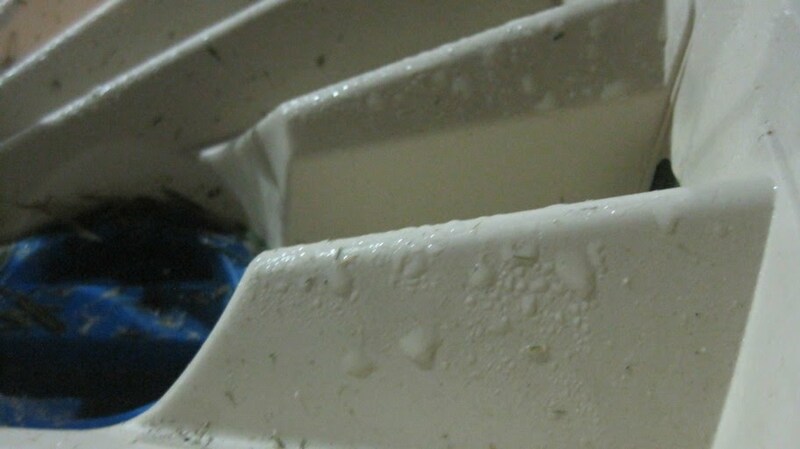 3/25/2012 - Woke up before 4 AM, and decided to walk down to see if the Waterboxx was in fact condensing water as promised. It was covered in water droplets. The temperature was about 59 F, from a high of 81 F the previous afternoon. Relative humidity at 4 AM was 93%, and dew point 57 F. Relative humidity of 93% is much higher than the Austin morning average for March of 79%. So we may be experiencing unusually good conditions for waterboxxes, if not for people. This is consistent with most of the waterboxxes maintaining their water levels even several days after rainfall. But not all waterboxxes may condense water at a rate that compensates for the emission rate of the wick. Wondering if things like partial shade, wick length, or even ground moisture and temperature affect how quickly the tank will drain. Dew point, the temperature at which water condensates, appears to be a function of air temperature and relative humidity (which may already be defined with account of pressure). It seems that when relative humidity is 100%, the dew point is the same as the air temperature. If relative humidity is less than 100%, dew point is less than temperature. I'm not completely clear on why dew forms even when the air temperature is higher than the dew point. Presumably the temperature of plants near the ground is less than the temperature in the air. But if the waterboxx is releasing heat trapped during the day, why would water condense on it? Meanwhile, a peak ahead to August shows Austin's average night-time relative humdity of 87%. A dew point calculator at http://www.dpcalc.org/ shows that at this level of humidity, dew point is 4-5 degrees below air temperature. Since that's not too far off what we have now in March, I'm hopeful the Waterboxx will continue to function in the summer as it is doing in the spring. We'll see. 3/23/2012 - Thanks in part to good rains, the waterboxxes have remained mostly full and the plants wet. Will be interesting to see how they fare over the summer if the rain stops. 3/15/2012 - A first inspection of several waterboxxes found that two seedlings had popped out of their holes. They were still in good shape (partly thanks to the moist environment inside the waterboxx well), so we reseated them. Also, the water levels of various waterboxxes vary widely. Some are completely full, others half full. Waterboxxes use a "wick" (looks like a short length of polyethelene rope) to pull water from the tank through a small hole to the plant area. Presumably these wicks emit water at different rates. Several waterboxxes are covered in grass trimmings where adjacent businesses mowed. When installing the waterboxxes, many people didn't seat the lid of the waterboxx so that it slipped into the inner part of the "donut hole" or well. Went back and did this to reduce risk of water in the tank evaporating out. 3/11/2012 - About 25 people from North Central Austin met at a bus stop to watch how to install the first Waterboxx, then broke up into teams to install the rest of them at eight other stops. 3/1/2012 - SN distributed a proposal for planting locations at nine bus stops to CapMetro and area neighborhood associations. 2/25/2012 - CapMetro finalized approval for the purchase of 10 Waterboxxes. SN purchased 10 more (at a cost of about $320). We also purchased 4" liners (tree seedlings) from Rennerwood Nursery in East Texas. 12/02/2011 - SN reached out to CapMetro, with a proposal to organize a trial of the waterboxxes at bus stops. 12/01/2011 - SN corresponded with the maker of the Waterboxx, to get references of people who used Waterboxxes in Austin, or in an urban environment. Two key questions - did Austin have conditions for the heat condensation principle to work well, and were the waterboxxes prone to theft? 12/01/2011 - SN did initial research, including reaching out to Treefolks and the City of Austin Urban Forestry team to determine if waterboxxes had been successfully used in Austin. 11/30/2011 - An architect who lives in Allandale forwarded the following article about a Dutch iris specialist who invented a device to self-irrigate tree seedlings. Learn more at www.groasis.com.